Applications for the 2018 fund have now closed. To view this years awardees, click here. To view the candidate guidelines, click here. Update: BEAM has voted to extend the SHSF to all states in the southern region. See the application for more. BEAM and the National Queer and Trans Therapist of Color Network (NQTTCN) have come together to establish a fund aimed at supporting the mental health and wellness of Black communities in states where Medicaid has not been expanded under the Affordable Care Act. This project builds on the pioneering work of NQTTCN in establishing a mental health fund for queer and trans people of color. 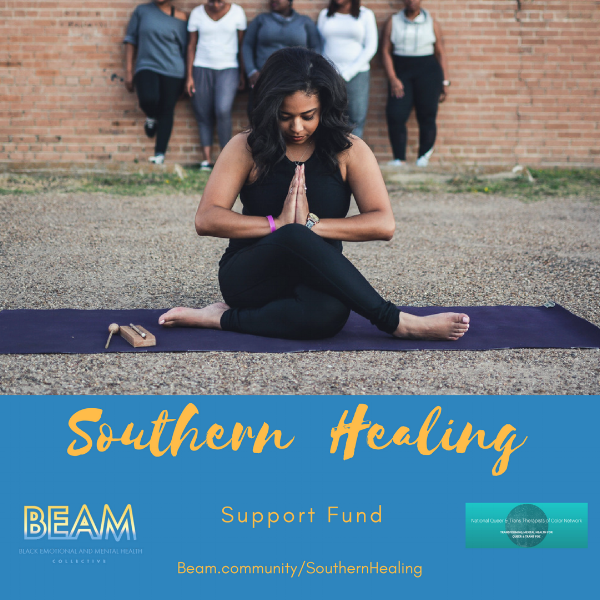 About the Fund: A community driven fund that gives awards to Black mental health and healing practitioners including clinicians, yoga practitioners, community workers, and group facilitators to implement FREE and innovative healing and support strategies in the southern states where medicaid has not expanded. According to the office of minority health, African Americans are 10% more likely to report having serious psychological distress than Non-hispanic whites. Medicaid plays an incredibly important role in mental health access. The federal program is the largest provider of behavioral health (mental health and substance use treatment) coverage in the United States. In 2015, Medicaid covered 21% of all people with mental health needs, 26% of adults with serious mental illness, and 17% of adults who received substance use treatment. The Affordable Care Act helped make behavioral health services as widely covered by insurance as all other health services. However, only four Southern states have expanded Medicaid, keeping the affordability of mental health programs out of reach. Nearly 90 percent of all people left without health coverage are in the Southern states, due to the lack of Medicaid Expansion. African-Americans are 13% of the total population but represent 24% of those left without health coverage without Medicaid Expansion. Mental and emotional health is critical to the lives of Black folks’ well-being. And yet, it is often overlooked. We are more likely to be uninsured and can’t often afford the services or activities that support our healing, or they’re not accessible because they’re not located in our neighborhoods. If you’re in the South, where most states didn’t expand Medicaid, access to all kinds of health care, including mental health services, are further out of reach. Who can apply: Black(1) Licensed mental health practitioners (LCSW, LMFT, LPC) (2) Licensed yoga teachers (3) Healing Justice Practitioners* (4) Community-based organizations with an operating budget of less than $250,000 annually (5) Community workers and mental health advocates. Awardees must demonstrate experience implementing programs, projects, services or interventions with Black communities that address mental health. Awardees must demonstrate a linkage to community services, including (but not limited to) substance use treatment, HIV/AIDS medical and prevention services. Awardees must demonstrate a historic commitment to BEAM's core values: challenging toxic masculinity, homophobia, misognynoir, trans-phobia in Black communities. Experience addressing HIV/AIDS, intimate partner violence in Black communities is a plus. Priority will be given to projects that seek to support specifically: Black women (cis and trans), Black gay men, Black people living with HIV, Black youth, and Black LGBTQ populations. *We define healing justice practitioners as individuals or collectives practicing non-clinical interventions aimed at offering social justice informed wellness support for marginalized communities. Participants in states: *Mississippi, Alabama, Georgia, Florida, South Carolina, North Carolina & Tennessee have all elected to not expand Medicaid are states where applicants are eligible.